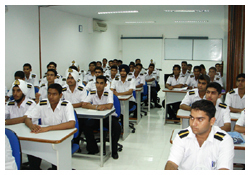 The course imparts training to cadets who have sailed on board vessel for atleast 6 months, so that they have a better understanding of the practical aspects and job responsibilities of a junior officer. This course imparts knowledge and practice on the safety and operational aspects from the view point of a junior officer and also builds on the work ethics and etiquettes to be followed when on board. Navigation and Bridge Watchkeeping is given greater emphasis through practical application using numerous exercises. COLREGS and IALA Buoyage system and their application. Practical seamanship and Maintenance on board ships. Bridge watch keeping and position plotting techniques on ship simulator. Chart work, Passage Planning, chart and publication correction and tide calculation. Practical Navigation, sight calculation and using sextant. Stability, Draft reading and cargo watch keeping. Etiquette, decorum, discipline on board. Code of Safe Working Practices. Occupational Hazards and Safety precautions for various types of tasks and shipboard operations. Handling of hand tools, powertools, manual lifting. Engine Room machinery / basics. Project work - PPT's made by Cadets on various marine topics. Exercises and practicals carried out in the workshop and machinery space area..